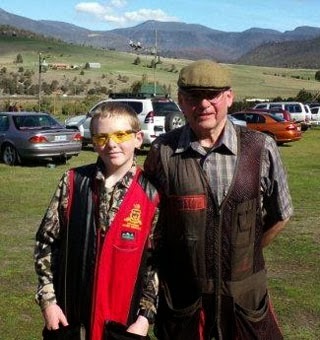 THE Derwent Valley Field and Game Club enjoyed good weather when it hosted the Tasmanian State Championships on September 15 at its lovely grounds situated near Boyer just out of New Norfolk alongside the Derwent River. The event was made possible thanks to the hard-working committee members as well as the great sponsorship received from Tasmanian Energy Brokers, Hutchinson Builders, Rio Oceania Pty Ltd and the New Norfolk Gunshop. Club president Ray Williams paid tribute to all who contributed to the success of the event, notably Keith Howells, Roger Manton, Ron Moses and Barbara, Michael White, Alex Eiszele, Malcolm Little, Tom Jenkins, Adrian Hepburn and Graeme Jarvis. "They areall very special people that made this such an enjoyable championship event," Ray said. More information about the club is available at www.dvfg.com.au and visitors are always welcome to attend on the third Sunday of each month. A practice shoot can also be arranged on most other weekends by prior arrangement. Results of the competition - high Gun: Michael Burling 95/100. AA Grade: first Grant Woods 90/100, second Paul Rigby 89/100, third Dwayne Evans 88/100. A Grade: first Darren Quinn 89/100, second Adam Bull 82/100, third Simon Bowden 80/100. B Grade: first Simon Gunther 84/100, second Alex Eiszele 77/100, third Jason Towns 76/100. C Grade: first Michael White 70/100, second Roger Manton 68/100, third Phil Cooper 63/100. Women: first Lea Coates 27/100, second Delia O'Daniel 24/100. Veterans: first Ken Triffitt 88/100, second Tony Johnston 78/100, third Ron Moses 73/100. Juniors: first Alex Towns 83/100. Sub-juniors: first Nick Towns 92/100, second Matthew Towns 76/100, third Lachie Peacock 54/100.